Even though Fall is in the air, I decided to make a Christmas card today with a little surprise inside, just a bit of a jump start on some Christmas gifts. I say a Christmas card, with this charming couple on the front it could also be an anniversary card for people who got married in December. 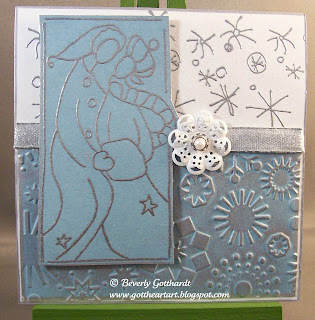 The stamp set is called Snow Hugs. This is a 4 1/4" square card so it will fit inside a 4 1/2" X 5 1/2" envelop and you won't have to pay extra postage for a square envelop. I didn't think that up on my own. I was surfing around the other day and was bad again and didn't write down who gave that tip, but thank you if you read this. 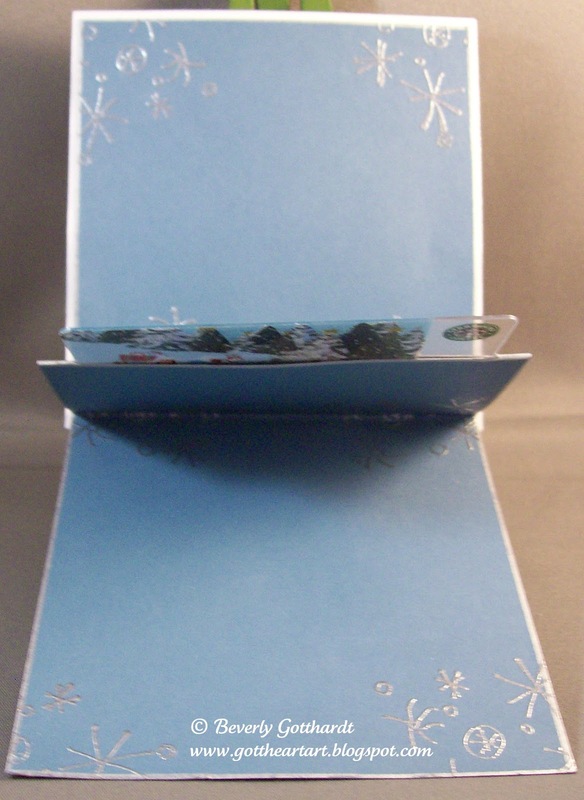 To make the inside gift card holder, cut a piece of 4" X 12" card stock, score at 4", 6", 8", the 4" and 8" are valley folds the 6" is a mountain fold. 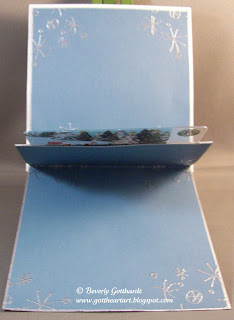 Cut a slit in the mountain fold to hold the gift card, tape the bottom of the mountain together, this creates the pop up gift card holder when the card front is attached. There are 8 stamps, 1 background, and 3 sentiment stamps in this set, so you too could get a jump start on some of your gift giving needs for the holidays. 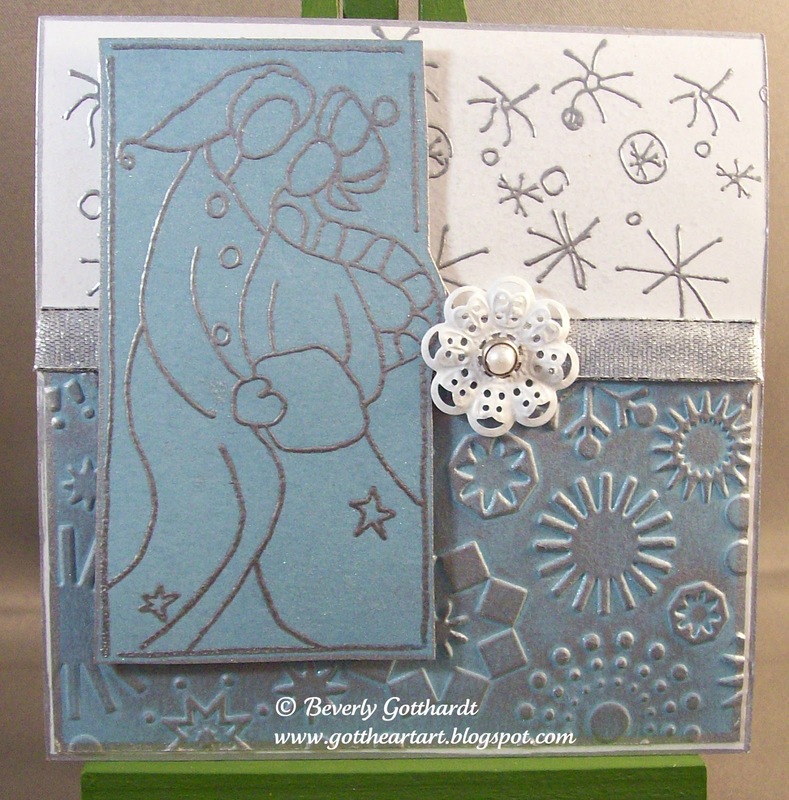 Supplies: Papers: SU-Baja Breeze, Stamps: Rogue Redhead Designs-Snow Hugs, Ink: VersaMark, Sharpie Paint Pen-silver, CTMH silver embossing powder, Craf-T Products-metallic rub-ons, Cuttlebug embossing folder-Snowflakes, SU-Vanilla Smooch Spritz, The Paper Studio Spare Parts-brad, ribbon-Offray, SU dimensionals. Love it! I love your design!